On March 30, Facebook launched a new look for business fan pages called Timeline, which drastically alters the appearance of your page. This is the new format for all fan pages, not optional. You will want to put some time into updating your page quickly, because otherwise it will not look right. There are several key points and advantages to know about this new layout. 1. Your cover photo is now panoramic, which means it’s a wide horizontal picture at the top of your page. I recommend using a team photo, or combining two photos side by side. You will have to combine the photos yourself before you upload the picture—this can’t be done within Facebook. It can be a photo of the dentists with the logo of the practice on the side. Do not put offers or promotions in the cover photo. Facebook doesn’t like it. Also, keep in mind this photo is public–anyone can see it who searches for your page. It will create a much nicer look for your page, so take some time with it, and change it every once in a while to keep it fresh. 2. Where before all your posts showed up chronologically, now you can “pin” a recent post and it stays up at the top of your page for as long as you want instead of getting replaced by the next post. Which means if you have a special post or photo, or a promotion, you can keep it well in view. Take advantage of this feature–it’s an excellent improvement. 3. 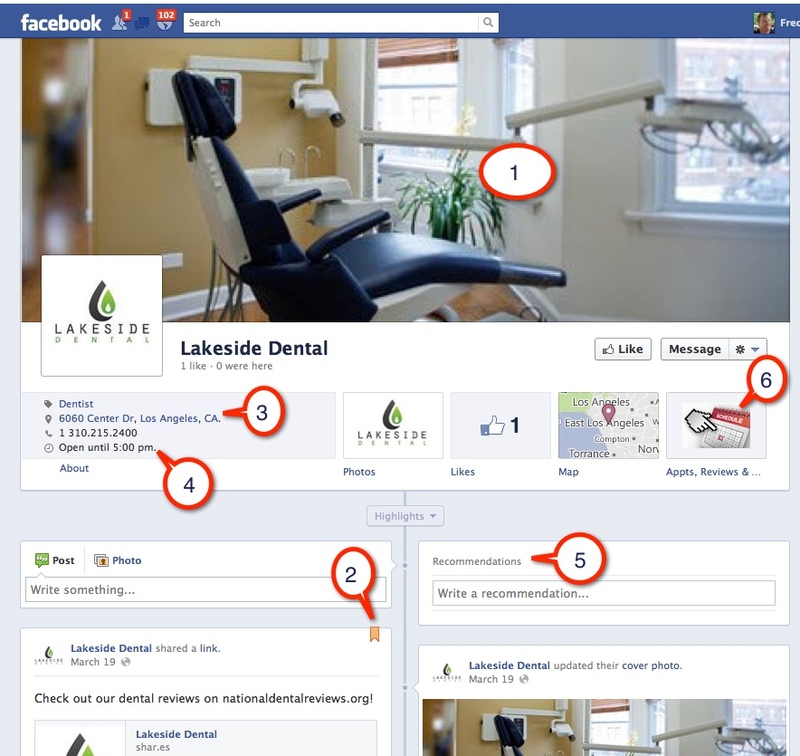 Your practice address appears right under your thumbnail photo, and people can click on it and get a map. It also displays your phone number. 4. Just below your address, it now shows if your practice is open at that moment. Facebook looks at your office hours to determine this, so make sure your hours are accurate and up to date in your basic information. 5. The next valuable change is that there is now a section that appears called “Recommendations.” This is written by people who have visited your fan page or “checked in” to your practice on their phone and then written a review. This is different from a wall post. If for some reason your recommendations do not appear, it means you have not set up your fan page as a “local business & place” in your basic information. Change that, because you want people to see what patients have to say about your practice. Also, underneath each recommendation is when it was posted, so you want to keep these fresh as well. (see my previous blog about using iPads in your office to get a steady flow of reviews). You don’t want recommendations sitting there that say “four months ago” or “nine months ago”. People want to see current reviews. 6. Under the cover photo you will see buttons for your applications. All of these can be selected by you except “photos”, which is permanently there. You should have an app that allows people to request an appointment, and another to show your latest promotions. (The one you see there is a feature of our Patient Activator service.) Also, you can change the name of any of these apps (except the Facebook basic ones), and you can move their positions so that the four that appear are the ones that you want. The Patient Activator application for your Facebook page automatically posts reviews, and you can add promotions, and it also lets people request an appointment and you’ll get an immediate email. This should be a feature of any digital communication application that you are using. Lastly, keep in mind that the most important part of your page will always be the wall posts, no matter what else Facebook changes. You will still want fresh new posts and comments all the time, posted by you and by your patients. Even when Facebook does its next unexpected change, which is inevitable, that will remain the core value of your fan page. Remember, your primary Facebook strategy is to personalize your practice and give your patients a forum to recommend you. This entry was posted in Advertising, Dental Marketing, Dentistry, Online Reviews, Social Media, Uncategorized, Websites and tagged advertising, dental marketing, dental practice marketing, Facebook, Online Reviews, social media, websites by Fred Joyal. Bookmark the permalink.